-EASIER ACCESS TO PHONE: Tired of getting up on a crowded train to squeeze your phone out of your pockets? With our Sim Smartwatch, you won\'t have to! After your sim card is inserted, you can use it as a regular cell phone which means you don\'t need to take your phone out of your pocket anymore just to take a few calls! 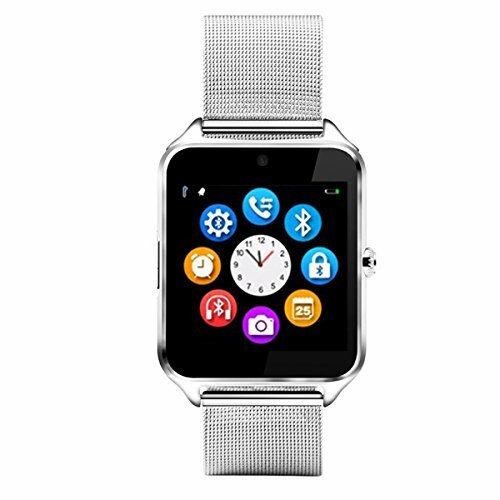 -THE PERFECT GIFT: Whether you\'re looking for the best father\'s day gift or the best mother\'s day gift or just the best gift for your children or yourself, our Bluetooth 3.0 SmartWatch for Men & Women is guaranteed to make their day! Design to look stylish and provide amazing features, our IOS & Android SmartWatch is exactly what you need! -HD DISPLAY: Our Android & IOS SmartWatch is made to provide the best experience to users which is why it features a classic round shaped full screen that has a high sensitivity HD touch screen to make sure you have the best SmartWatch experience possible!